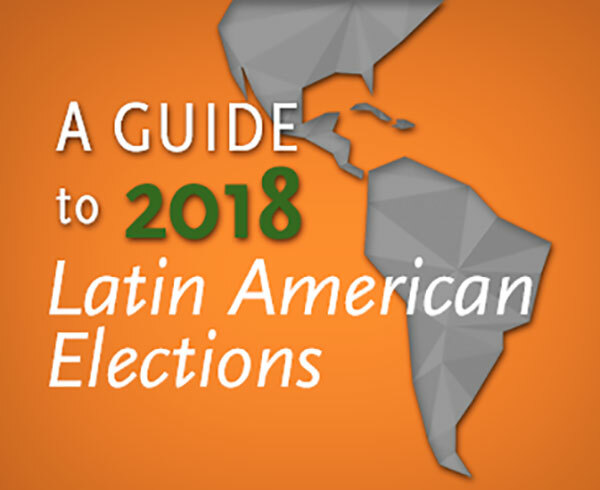 In 2018, the three biggest countries in Latin America—Brazil, Colombia, and Mexico—elected new presidents. But those weren't the only ones where voters went to the ballot box in a year that saw sweeping political change across the region. AS/COA tracked the votes through articles, poll updates, podcasts, and programs. In Mexico, Andrés Manuel López Obrador took office December 1. Through regular updates, AS/COA covered the start of what the new leader calls the country's Fourth Transformation. Listen: Former Ambassador Arturo Sarukhan says migration tensions will be an early test for Mexico’s incoming president. Plus, Speyside Mexico’s Amy Glover on the chances for positive change. Three months since his electoral win, Mexican President-elect Andrés Manuel López Obrador is already taking on violence, education, U.S. relations, and a massive airport project. Listen: With work to be done to build a counterweight, President-elect Andrés Manuel López Obrador’s party has plenty of room to push through priorities, says Odracir Barquera. From NAFTA negotiations to Chinese relations, panelists explored Mexico’s trade opportunities under incoming President Andrés Manuel López Obrador. So far, Mexico’s next president, Andrés Manuel López Obrador, is looking north more than south, writes AS/COA's Carin Zissis. Mexico's next president made major campaign pledges. A panel of experts assessed if and how he can make good on his promises. Mexico’s future president meets with Mike Pompeo, Kirstjen Nielsen, Steven Mnuchin, and Jared Kushner this week. AS/COA’s Carin Zissis explores the meeting’s context. MORENA, the party of President-elect Andrés Manuel López Obrador, saw sweeping wins on election day at both the state and federal level. Nine of Mexico's states held races for their top posts. The governing PRI lost all of them. The third try turned out to be the charm for Andrés Manuel López Obrador, Mexico’s next president. What will Andrés Manuel López Obrador's electoral victory mean for Mexico's energy sector? AS/COA's Naki Mendoza explains in About Energy. We monitor the findings of some of Mexico's main pollsters to see how candidates are faring ahead of the July 1 vote. AS/COA's CEO and president spoke with J.P. Morgan about what investors think about Andrés Manuel López Obrador, the frontrunner in Mexico's election. Nación321’s Pancho Parra talks about why the youngest voters back the oldest candidate and their expectations for the future. Mexican pollster Jorge Buendía explains why Andrés Manuel López Obrador’s poll lead keeps growing, and how the election is redefining political rivalries. From polarization to ageism to the expat vote, AS/COA's Carin Zissis covers trends of note in the countdown to the presidential election. “Who is the real [Andrés Manuel] López Obrador?” This was one of the questions Dresser posited to the Mexican presidential frontrunner's economic advisor. We’re down to fewer than 40 days until Mexico’s election. Amid unease over NAFTA timelines, we take a look at how relations with Washington factor into Mexico’s July 1 presidential vote. A new PRI head, AMLO and business leaders, an ill-conceived tweet. AS/COA's Carin Zissis writes from Mexico on the latest issues shaping the races. How significant is the under-35 electorate in Brazil, Colombia, and Mexico? The governing PRI could lose all nine races, but it’s not the only party at risk. Here’s why these seats matter, along with potential victors ahead of July 1. The much-anticipated event was seen as a chance to dent AMLO’s formidable poll lead. Here’s what happened during the April 22 debate. Watch: Get insights on the truth about polls, what an AMLO victory could mean for the energy sector, and bright spots for Mexico amid a fierce electoral battle. The presidential race is officially underway. Here's the rundown on the country’s biggest election in history. Mexicans won't pick their next president based on Trump tweets, but that doesn't mean bilateral ties aren't in jeopardy, writes AS Board Member Arturo Sarukhan in The Hill. Energy reforms take time to bear fruit and protectionist election pledges would lead to backstepping, writes AS/COA’s Naki Mendoza. Latin Americans will vote for nine new presidents in two years, along with more than 2,900 legislators. In a March El Financiero presidential poll, the PRI’s José Antonio Meade takes the number two spot by a hair, but frontrunner Andrés Manuel López Obrador now has an 18-point edge. We’ve got some time until the July 1 election, but the race is heating up for the next occupant of Los Pinos. If 2017 was the year that changed Washington, 2018 will redefine Latin America. AS/COA experts explain how in our first podcast of the year. On November 27, José Antonio Meade threw his hat into the ring. Can he beat Andrés Manuel López Obrador—and a whole host of other contenders? Victor Herrera, former Mexico City office head for S&P’s Global Ratings, spells out what’s in store for Mexico—from elections to NAFTA talks.